HARMLESS THOUGHTS: Advertisements on Blogger! I can't believe that there are advertisements showing up on my blogger comments! It is just plain stupid. Who thinks that this advertising method will work? Can they not see that it is just going to make people mad?!? 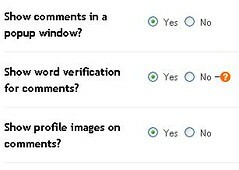 Make sure you select yes, and save your settings. Once you republish it should take affect. Here is some more help on the subject.